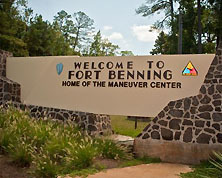 Fort Benning is located in an area commonly known as the "Tri-Community", comprised of Columbus, Fort Benning, Georgia, and Phenix City, Alabama. Columbus, known as Georgia's third-largest city, is a growing community of 250,000. Besides being the home of the Best Army Installation in the World, Fort Benning, Columbus is the corporate headquarters of many leading companies. The stunning Florida gulf shores and picturesque Blue Ridge Mountains are only a few hours' drive from Fort Benning.